Boasting muscles a superhero would be proud of, Matthias Schlitte has good reason to be considered the toast of the German arm wrestling circuit. But a closer look reveals that only ONE of his arms is bestowed with bulging biceps. 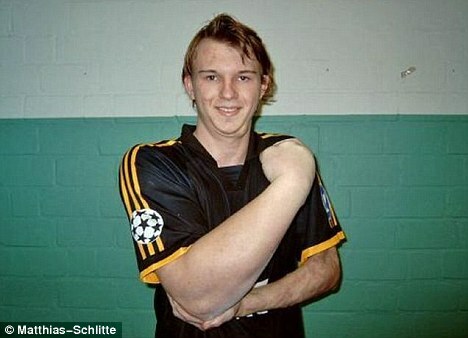 The 22-year-old’s whopping right forearm measures nearly 18in – and is in stark contrast to his puny left arm.